I voted, and I voted the RIGHT way. Please vote, every vote does count. If you don't believe it, then why do the politicians spend so much money trying to influence you? Vote, pray, and may God continue to bless America. I just got back from a very full polling place. It felt so good to fill in those Conservative ovals! Our last local election had a recount and the mayor was won by 2 votes. We are all vitally important, every last one of us! this is the first time i have seen my voting precinct look a little like your cartoon and it was a good feeling to know that i was not voting alone. Well said A.P. I voted and will pray tonight to give me courage to face whatever has happened. This is a decision that will affect us in a positive way for at least a decade or throw us into a depression with no end in site. I also went to vote after work. It was my pleasure to cast my vote against Barbara Boxer. I think unless a miracle happens that we will still be stuck with that arrogant good for nothing but a tax increase or business killing regulation woman. Well, I did what I could, we'll see what happens. I am pleased to report that Okla. has our first female governor, Mary Fallin (R). We have another first, a state republican dominated House and Senate. Conservative values are good, but how much better it would be for the people of our state to repent of our sins and turn back to God so that He may heal our land. Congratulations, CanJar! I hope Mary Fallin does a great job with strong support. And I was really gratified to see the overwhelming numbers by which y'all addressed the issues of international and 'that other' law. YAYY! It's no wonder so many folks are moving back there and your economy is doing so well. Linda, I can't shake the funk off the feelings I get when I see how California voted. Again. 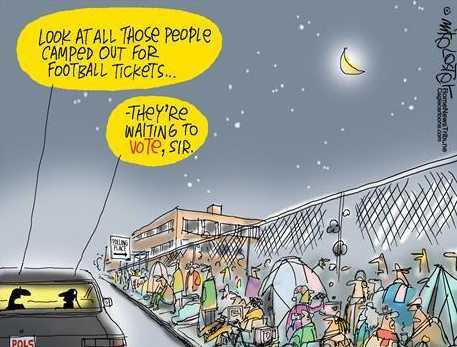 As a former elections commissioner down there I know of a certainty how much 'help' the dems get from illegal votes. If it weren't the home of so many loved ones, the beloved place of my birth and such a huge player in our national and world economies I'd almost want to say it deserves what it gets. Likewise for Nevada. I look for an influx to this region of 'refugees' like myself and Patrice, and won't be surprised if moonbeam gets the gray davis exit visa. I don't see any sign here today of A.P. and it's nearly 2:30 in the afternoon in California. She may be feeling like I do today, as I wait to see if the dem machine's going to make off with yet another election by their usual means. Being left coast conservatives sure has its challenges. Overall, though, Americans spoke a loud word yesterday, a historically loud word. Now we'd better be about the business of being prepared to enforce our will upon our public servants, from the top down, and make sure we turn our face as a nation back to God. I always knew those Okies were pretty smart. As far as the the west overall, which I thought was coming to their sences... I was wrong. Congrats California you win the booby prize this time around. Today I hang my head in shame. I love my California, it's the people I can't stand. How can so many be led by so few to elect such morons? The entire state's executive branch is Democrat now. the same old tax-and-spend losers who got us where we are today. The majority of the voters must be either asleep or on the dole or forgot to take their meds. I do wonder about the number of illegals who voted. We don't have to prove citizenship to vote in this state. we merely have to prove residency. So, show your electric bill and you can register to vote. Great, huh????? We can thank Governor Moonbeam for that (Jerry Brown, governor-elect). We've got Governor Moonbeam again - this time a new generation of idiots elected him. The first generation of idiots to elect him are now collecting social security. Their grandkids voted for him this time. I hope they're happy when he and his Democrat state assembly vote to raise taxes on everything, including the air we breathe. Literally. Thank God the rest of the country (except Nevada and Delaware) had the common sense to vote out the big government progressives and give the Republicans another chance. The Republicans had better do the right thing this time, or they will cease to exist as a viable party come 2012. Good job, everyone. Now let's get to work and restore OUR oountry to what our Founders envisioned for us. I am highly disappointed that I live among such morons. However, when it comes to California, the bay area, LA, illegal and the welfare vote dictate how the state goes. I live in a fairly conservative area. We just elected a member of the minute men project to the State Assembly. But the people in the city are walking around with blinders on. I'm going to have to work even harder now to make the exit plan a reality. Oh, and to those out there who understand the disappointment that AP, A.McSp, & I feel thanks. Well, move over A.P. and Linda...we just got the bad news that Patty Murray has been re-elected to a fourth term as our U.S. Senator. I'm disgusted and ashamed of what that signifies and what it will mean to us in practical terms. It's a sad day for Washington state. YAY! Minnick is outta here! 2 strikes against him for me...one, he voted for Pelosi to get that damn gavel, and two, I heard him say on the Nate Shelman show, "I don't care if 60, 80 percent of my constituents are against some issue, I'm going to vote for it if I think it's good for Idaho. ", like we were a bunch of stupid little kids, who needed HIM, the parent, to tell us what's good for us. Elitist pig. Plus, he snickered through his debate with Raul Labrador. Tacky. Now, I'm not crazy about Raul, either...my vote was not FOR Raul, as much as it was AGAINST Minnick.